I had the same misconception since even a cheaper tube amp sounded better than most of the ‘typical’ solid state amps found in music stores, but when investigating boutique builders who have years of experience and knowledge, you are hard pressed to find amps of the same quality and diversity as those developed by Eric Pritchard (who holds 14 US patents, 11 utility and 3 design, as well as numerous foreign patents). Lance continued about how the other bands sounded muddy, yet his guitar sounded loud and clear – cut through the mix like no one’s business. Hmmmm... loud, clear, sounds like a tube amp with plenty of character, and with voicing possibilities to make it sound like other amps we have come to know and love. I had to investigate more and was anxious to compare this to the tube amps I have in my studio, as well as a Marshall solid-state 100 amp head (MG100 HDFX). 3. More alive and less ‘processed’ than a solid-state amp. Eric added, “As you might imagine, the tube sound is not native to solid state in any form. So all of the tube sounds had to be done in extra circuitry, such as the triode emulator is done with an op amp plus a circuit to do grid conduction and another circuit to do the plate characteristic. The output stage does what a class AB push-pull output stage does with the added feature of a Watts Knob that keeps that ‘balls to the wall’ characteristic at lower level.” Well... some of the techno-talk is beyond my knowledge and understanding, although very elementary to Mr. Pritchard and those with an engineering/electronics background. But I know what I like as a long-time (albeit amateur) musician and composer – practical diversity (lots of functions you can use and would want to use) and great sound that is organic and as natural in its tonal characteristics as possible. Both the range of options and the real user testimonials from professional musicians is what brought me to seek out Pritchard Amps, and which is what inspired this lengthy review as I integrated, to the largest, extent a Casper GT custom guitar (super sensitive solid ash body and Joe Satriani DiMarzio pickups with floating bridge and brass block) and various effects from Boomerang, SolidGoldFX, Analog Alien, Source Audio, Pigtronix, Digitech, Empress Effects, Jam Pedals, and others. When I took the 180-watt PDP (60 watts clean, 90 watts dirty/peak clean power and 180 watts at ‘peak distorted power’), 12-inch speaker Black Dagger out of its box, the first impression was that this amp was no ordinary factory-assembled fabrication. It screamed ‘boutique’ in every way, from the engraved lettering on the amp chassis (e.g., volume, boost, reverb, etc.) that then is hand-painted with gold, to the retro gold hardware and edging on the front with matching wicker grill. The back panel on the amp is impressive equally, with all its features engraved and painted in gold against a black metal backdrop – ideal for easy and quick viewing when necessary. The color was right up my alley, a heavy Tolex material that merged dark green and black marbling with matching black corner bumpers and handle. There also are two side handles for easier transport, although this amp weighs less than other tubes in its class, at 42-pounds. Along with the gold paint and grill, it’s a very eye-catching package that does not suggest ‘mass production’ in the least. What I like about this knob, particularly, is that you get the most out of the amp (by controlling the gain of the first stage) relative to your playing style and your guitar (humbucker vs. single coil output levels). This knob alone creates various tonal characteristics relative to the remainder of the amp settings. The Boost and Crunch buttons (accessible on the amp or via a footswitch) are two highly-complimentary options to push one’s tone into that extra dimension. The Boost increases volume to whatever degree the knob is turned, but it adds a sizzling presence (that is slightly distorted in nature) that makes it ideal for lead playing and to cut through the mix even better. The Crunch, as well, adds some volume, but with a grit that helps take those lead solos and driving rhythms a step further (Warning: Experiment with this amp before adding all your drive and distortion pedals!). Even when playing softer music the Crunch adds a nice thickness and edginess that keeps me coming back to it repeatedly. Neither the Boost nor the Crunch seems invasive in the least and the ears can tell that it’s the same amp with the same character, but with a bit of steroid injection. What helps to set these features apart from other amps is that it has a built-in Treble/Mid-Noise Gate that operates when both the Boost and Crunch are activated, making for whisper-quiet operation even at high levels. If you hear anything but your playing, check the cables and pedals because it definitely is not the Black Dagger! What makes the drive and touch-sensitive distortion qualities so beautiful with this amp is that Eric integrated diverse electronics to achieve a multi-faceted and multi-layered effect. First, the Black Dagger has a ‘drive limited distortion,’ the type of tone you get just before an amp fails, achieved by keeping the Watts Knob down and the volume up (“the usual voltage limitation is replaced by a limited output current. The speaker impedance characteristic then gives the amplifier a different tone”). The ‘vintage distortion’ characteristic is used in the lesser dirty modes and gives the sound or effect of rocking back in the 60s and 70s. The ‘saturated distortion’ is akin also to some classic amps, and is heard as you boost the single with the Boost switch. When applying the Crunch you then hear a ‘high gain distortion’ that is more commonly heard in modern boutique amps. Inspiration is all that is needed since, as one forum member on www.TheGearPage.net stated, “The Marshall setting on Pritchard Amps sound more Marshall than Marshall!” Having owned and played on a few Marshalls, I concur. As well, the F setting is so thick and rich, it’s difficult not to crank out some heavy riffs from 60s and 70s rock and think you’re playing on some vintage Fender gear that can range from its Tweed to Blackface. And the V setting is so reminiscent of Jimmy Page’s studio work on some of his Vox-induced guitar playing that it transported me back into time, playing Zeppelin on my old vinyl player when I was a teenager. The Smooth Solo and Liquid Lead voices may be ideal for jazz, blues and country, but add in the Crunch and Boost and there’s enough edge for soft rock (a Santana-type voicing) without going the full distance in distortion and overdrive offered through the F, M and V settings. The Liquid Lead is a combination of both American and British tones (“it combines the Marshall bottom with a Boogie [Mark Series] overdrive top”) and does offer more edge than the jazz-based Smooth Solo (ideal when accentuating bass and treble for clean solos)... but it’s that Marshall-inspired voice that really gets the lead solos soaring. The Effects Loop works beautifully; a guitar may sound fine with a delay and various modulations running direct to the input, but when added to the back of the cabinet’s Effect Loop, the detail becomes crystal clear. Although other effects loops on various amps tend to handle their job sufficiently, there was a certain degree of tone loss in the process, which I found typical with tube amps. This is not the case with the Black Dagger – the tone held true while reducing any minor ambient or exaggerated artefacts inherent with the pedals. This got me thinking about how various boost and distortions would handle within the Effects Loop. When running the effects direct from my guitar to the amp, I found the Black Dagger to be one of the best sounding amps in terms of its organic nature, aside from its diversity with the ‘voices.’ However, running the overdrives and distortions through the Effects Loop gave a different dimension to the pedals. The best way to compare it is as follows: when the drives/distortions are direct to the input the sound has more sizzle and grain/grit... that ‘down and dirty’ sound; when placed in the Effects Loop you achieve that fat robust driven tone, but without the grit or as much dirt in the mix. For someone looking for both (barring the ‘crunch’ and ‘boost’ options of the amp), having some drive pedals through the Effects Loops and then the distortion/fuzz direct to the Input would make most guitarists happy campers. As Eric added, “the Return jack has two functions. The tip is a serial return and the ring is a parallel return. One customer has two amps that are connected via a delay that runs from the Send of the master amp to the Return of the slave amp. The two 4-10s produce a huge sound.” A third function is that it can work with a low impedance volume pedal with only a single jack cord. The Equalized Direct (EQ DI) really caught my attention prior to obtaining the Black Dagger. I’m a fan of being able to hook an amp head directly to a mixing board for low level recording, but while maintaining as much tone from the amp as possible (miking the amp can produce better quality sound, if you happen to have the right equipment and expertise). The EQ DI is a mike level, XLR output, which has an ‘idealized response of a 4-12 closed back cabinet.’ And for my preferences the Equalized Direct can drive mixers, studio or PA extremely well. What further makes this useful is that with a small amp, like the Black Dagger 12-inch cabinet, it’s easy to stay within the mix and to sound great without cranking everything up to ear-splitting levels. Another great feature is the dual Speaker Jacks. Obviously you can play at ‘gig’ levels, but this jack also can drive 4-ohm and 8-ohm (requires special cable) cabinets. And then you have the patented PJ (practice) jack that allows you to play at tone compensated levels, at about the volume of an acoustic guitar (and even lower!). The amazing thing about the PJ option is that it retains a large portion of the tonal qualities of the amp as though turning it up at high volumes. And like any good amp, the Black Dagger comes with a Footswitch controller so that you can add the ‘Crunch’ and ‘Boost,’ features I explained earlier. As well, the amp is designed so that you can work the front panel switches even with the footswitch connected. That may be a nice feature, but what is down-right cool is the footswitch that controls the two Five-Inch Horns built into the base of the cabinet. While using the amp straight (no effects), the horns add some high end in the mix (which then can be reduced or controlled via the EQ if desired), but what is so obvious with these horns is how the sound pushes out like it’s turbo boosted (no kidding when I say you can feel it), as the guitar tone becomes even more clear, cuts through the mix even better, and seems to engulf the room. When you add any distortion into the mix, and while using the horns, the grain or tonal texture is like a buzz saw cutting through wood – fabulous for metal playing! The best way to describe how the horns work without and with distortion is that it sounds more vintage and thick without the horns, and with the horns invoked (along with distortion), it’s more like a modern-day rock/metal amp. The circuitry of his amps certainly has much to do with hearing those low notes very clearly (pay attention all you Drop Tuners! ), and this is obvious when running the amp direct to a mixer – but it’s also obvious when using the amp’s speaker and cabinet with its Tunnel Back design. I was able to run various EQ settings, fuzzes, distortions... you name it... and those low notes resonated so well out of the Black Dagger (even when pushing the bass a bit heavy); something I could not achieve to any equal extent with a tube amp or other solid state amps. First, this is by far the most touch sensitive amp I have used. In other words, you better have your chops up to speed if you plan on using a Pritchard Amp as it picks up every detail... and this is relayed in both the tone and harmonics, thus making it an incredibly lively amp – nothing ‘flat’ sounding about the Black Dagger. Second, this amp is far more sensitive with the tone controls and pickup selection on my guitars (ranging from a Casper GT custom, to an Ibanez JS2400 and a Slash Custom Les Paul) than with any other amp I have used. The differences in bridge vs. middle vs. neck pickup is far more ‘in your face’ than I have experienced, thus making tonal adjustment and experimentation, at times, more frustrating due to the much larger palette now at your fingertips. Have fun! Likewise, the Black Dagger is very sensitive with effects, and this became very obvious with my Boomerang chorus/delay pedal, a high end delay that has a very transparent and organic quality. 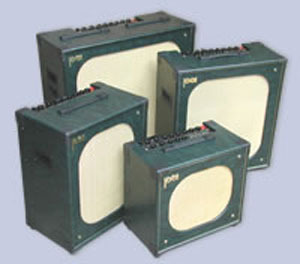 On other amps (both solid state and tube) I used a few pre-sets regularly, and they sounded fine even in my recordings. But I have to reduce the ‘repeats’ and degree of ‘mix’ of my delay with the Black Dagger, as the amp cleared up the tone that resulted in the delay sounding too big and lasting a bit too long (conversely, it muddied up much faster with other amps). Pritchard Amps boast a ‘Best Amp Guaranteed’ (30-day trial run) policy and 3-Year Limited Warranty. This is unheard of in the amp industry, although one would think it should be common. However, Eric Pritchard is no young pup, which means both years of experience and also growing up in a time when customer service and standing behind your product meant something. It was this philosophy that spurned his desire to offer the best service before and after an amp has been sold (call him up and he will talk with you for as long as you like!). Moreover, you are not limited to simply buying one of his amps. As Eric told me... any part of his amp can be changed and “for example, some jazz players prefer less harmonic embellishment. No problem, change a couple of resistors.... So these amps are highly modifyable.... No one has taken me up on it, but that is exactly what Phil Zuckerman and I did for years in the development of these amps.” Thus, if you have an idea of what you want, before or after purchase, Eric can customize your amp to achieve a truly unique and individualized signature tone. Eric provided me a brief outline of the manufacturing process, which I would like to share here: “I moved my machine shop to West Virginia back in 1988. I designed and built special production equipment for a variety of manufacturers. And so, it was nothing new to design and build fixtures and equipment to build amplifiers and cabinets. I bought a CNC milling machine to engrave and mill the chassis sheet metal. Then, after some cleaning up of the metal, the chassis is bent into its five sided shape. The corners are welded and the chassis cleaned further to give a good finish after being black anodized. Then the lettering is filled with gold paint by hand. “The cabinet panels are blanked out with a panel saw, cut to size with all its features on the now modified copying router. Some of the parts then are cut with the box joint saw. A test assembly of a cabinet will stand without any glue or fasteners, and then the cabinets are glued, sanded, and painted black. The Tolex (covering) is glued on with a high-quality glue that does not crack in cold temperatures. The Tolex then is cleaned up and sprayed with a clear coat to make the Tolex grain and colors stand out. Finally, the hardware is put on, the reverb tank installed, and the speaker(s) wired and screwed in. “The amps are assembled by hand. The boards are stuffed and soldered by hand. Some parts, such as the pots are soldered in place with the help of special fixtures. The boards are wired together by hand also in fixtures, and then the amp is tested in another fixture that absorbs the heat of an amp driven hard. The amp operation is checked stage-by-stage and condition-by-condition for about four hours to insure proper operation. I have always found solid state amps to offer a cleaner tone (although sometimes too ‘thin’ or ‘cheap’ sounding), and they generally accept effects better (cleaner sounding with less muddiness), but up to this point I preferred the more rich, full-bodied character of tube amps. The Black Dagger changed that perception as it delivers such diverse harmonics and nuances one would come to expect in a quality tube amp, but has done so with greater diversity in what Pritchard Amps offer and with superior clarity of those lower register notes. And, there is an interesting page on the Pritchard website, of professional musicians who own particular Pritchard Amps and what other amps they have retired (ranging from Boogie to Marshall). I suppose I’m now on that list, having retired an Egnater Rebel-30, a Peavey Mini-Colossal, an Orange cabinet and a Marshall head. I previously retired a number of other amps, both tube and solid state, looking for a tone that satisfied my ego and remained clean and clear on recordings; and the Black Dagger helped me to arrive at my destination after a long journey. Incredible volume from a small package; plenty of vintage tones without going tube; less weighty than a tube amp the same size; diverse in its voicing, thus allowing you to achieve inspired Fender, Marshall and Vox tones; sounds just as good at super-low levels (ideal for practicing) as compared to cranked levels... something that cannot be achieved with most tube amps; you can record direct to a mixer via the XLR output, although miking from the front and into the rear chamber can make this a studio musician’s dream; the added 5-inch horns really push the sound forward (their use is optional); a very detailed user manual to get the most from the amp; all Pritchard single channel amps fit all its single channel cabinets and all Pritchard dual channel amps fit all its dual channel cabinets (there is very little difference between the two, thus giving buyers a choice... they can pick amps for amp reasons and cabinets for cabinet/speaker reasons). Individual ‘voices’ cannot be selected by a foot switch (which would increase circuitry complexity significantly); high distortion levels (e.g., Metal based music) require some pedals in the mix; many guitarists are so conditioned into believing that tube amps are superior that the cost of a Pritchard amp (although hand-built in every detail) and being associated with ‘solid-state’ technology (typically made to be cheap) makes it less likely to be a key purchase for many guitarists... very unfortunate. For more information, visit www.PritchardAmps.com; MSRP is $2100 (the two-channel Sword of Satori is $2300).